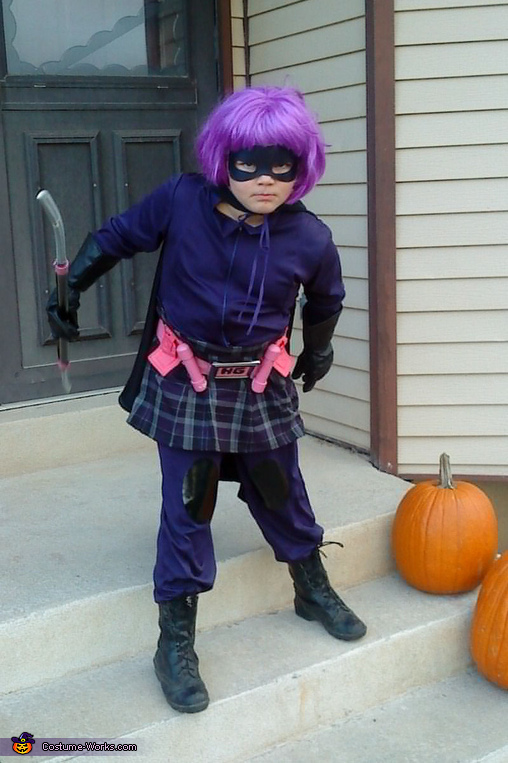 I made this Hit Girl costume. Hit Girl is a character from the movie "Kick A**." I used a few different patterns to make the jumpsuit, cape, and skirt. The belt I used pieces of PVC pipe and caps and spray-painted. The bucket is actually a small picture frame. Her weapon is a long PVC pipe with an elastic so she can wear it around her neck while trick-or-treating. In the end, I took two cheap plastic swords and broke the handles off and then shoved them into the PVC pipe and secured them. It was one of my favorite costumes I've made.